Have been busy lately. Just enjoying summer. There will be more updates soon, so check back. 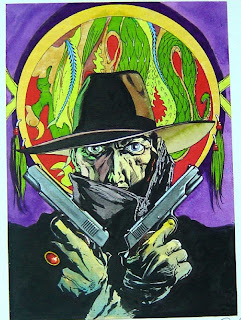 Until then, here's an unpublished the Shadow cover by Rolf Gohs! Made with a BIC pen (! )and watercolors in the late 80's/early 90's. The artwork for this one is buried somewhere in my evergrowing stacks of original art. Should have it displayed I guess. Posted here for just one reason. It's so damn good!